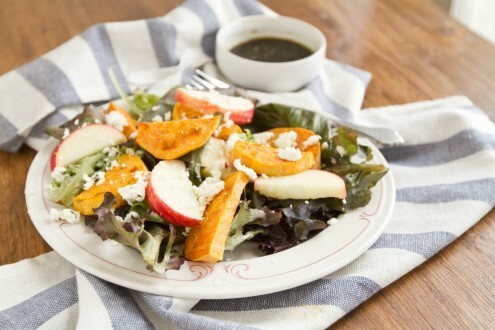 Roasted Sweet Potato and Apple Salad | Naturally. Growing up I associated eating salads with summer. It made sense that during the hot summer months I would want to eat something that was easy to prepare, didn’t require an oven, and healthy. While in the fall there aren’t the traditional tomato and cucumber toppings but instead squash, sweet potatoes, and apples, salads can seem a little meh. Yet, once you get past the fact that a salad can be whatever you make it, the possibilities are endless. 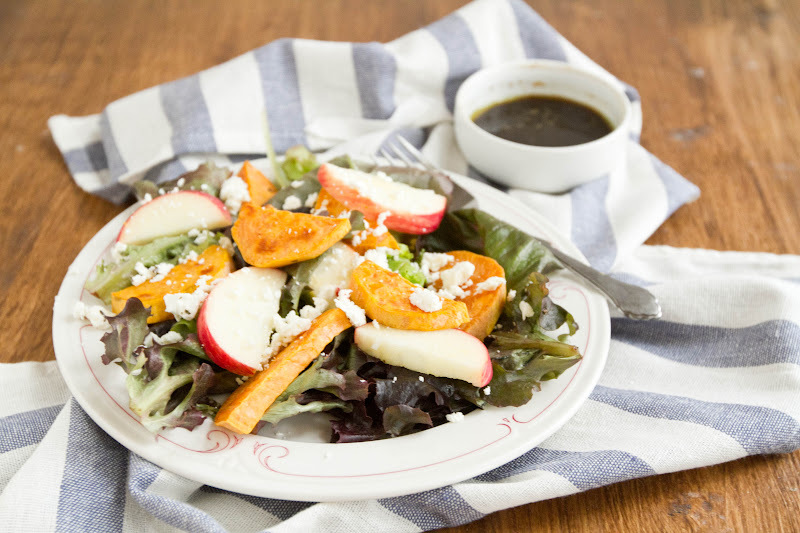 The crispness of the apples paired with the roasted sweetness of the sweet potato are nothing short of the perfect salad topping. Add in a tangy cheese, a few roasted walnuts, and a delicious maple dressing; you’ve got fall in a salad. My advice: venture out in the idea of eating salads in the fall. You won’t be disappointed! Peel sweet potato and slice into 1/2″ wedges. Toss with olive oil, salt, and pepper. Place on a covered baking tray and roast for 25-30 minutes or until sweet potatoes start to brown. Remove from oven. 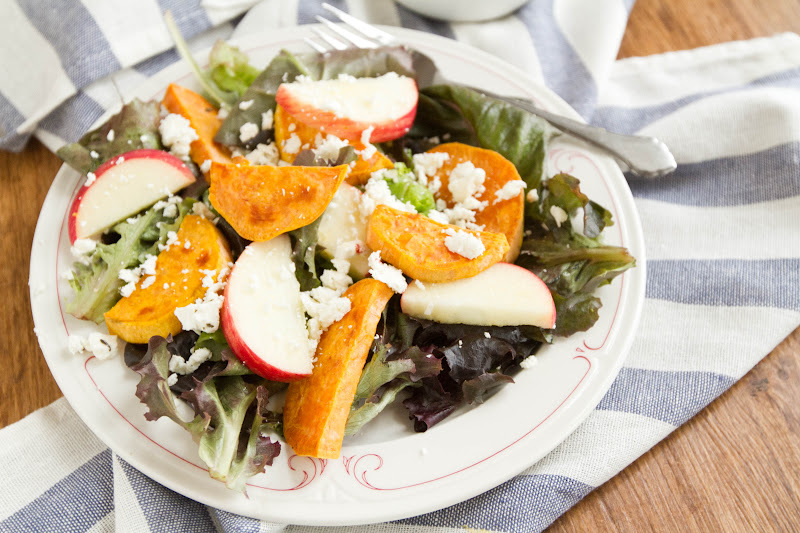 While sweet potatoes are in the oven, wash lettuce, slice apples into 1/2″ wedges, and toast walnuts if need be. I like to toast nuts in a skillet, shaking occasionally until fragrant. Once sweet potatoes are done, assemble salad. In a bowl, whisk together oil, vinegar, maple syrup, and mustard, tasting and adjusting as need be. Serve immediately. Love fall salads! And where I am in San Francisco, it never gets hot enough (or cold enough) for lettuce to be out of season. In winter it doesn’t always feel right, which is why I love boosting them with hearty things like you’ve done here. i can taste the crispness of those apples and the sweetness of the taters – yum!